Have you ever had a DIY disaster? Shelves falling down and tins of paint being spilt are probably something we have all experienced. Sometimes though things can be a lot more serious and these accidents and incidents can cause serious injuries. With many dads this coming Sunday being given a DIY related present it's important to take some time and prepare properly. I bet we all know someone who discards the instruction manual and gets stuck in without proper preparations. With this in mind don't just give your dad a card and present this Father's Day but also offer some safety tips from today's guest post. “This Father's Day, hundreds of DIY-loving dads across the country will receive nice new pieces of DIY equipment. As well as a range of high-quality chemical treatments, Sovereign Chemicals also stocks a selection of equally high-quality safety equipment perfect for any DIY job. Good-quality safety gear and a few good practices can help ensure that when they get stuck into that job they have been meaning to do as a way to try out those presents, they will be able to do it safely. Using safety equipment - and making sure that you have all the equipment that the job in hand calls for - is one of the most important steps that a DIY dad can take in protecting their safety. For example, working in a dusty environment or performing any job that is likely to produce fine particles requires a dust mask. Other jobs such as spray-painting can also benefit from an appropriate mask to prevent inhalation. Equipment that produces loud noises should only be used with suitable ear protection, and it is wise when carrying out a great many different jobs to protect your hands with appropriate work gloves. Ladders are one of the biggest causes of accidents when carrying out DIY, and they should be used carefully and properly. Ensure that they are secure and stable before climbing them and that they are not placed on uneven ground, where they are likely to shift or tip. You should ideally have another person present to hold the ladder. Do not overreach or excessively lean while you are on the ladder, as this can cause even a seemingly stable ladder to lose its balance and come crashing to the ground - bringing you along with it. Use power tools carefully and according to the manufacture's instructions. Ideally, you should choose tools with a plastic body, as this will minimise the risk of an electric shock if an electrical fault should develop inside the tool as a result of the many knocks and bumps it will undoubtedly take. Do not rush jobs that involve power tools, as trying to hurry yourself will increase the risk of an accident. Avoid wearing loose clothing or jewellery, which may get caught in the moving parts of power tools. If a faulty electrical power tool should start a fire, do not attempt to put it out with water. Use a fire blanket or, ideally, an appropriate CO2 or chemical fire extinguisher. 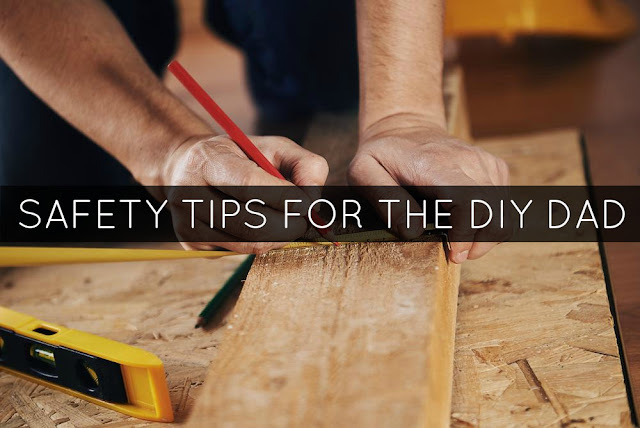 One of the most important safety steps in DIY is not to try to take on a job that is beyond your capabilities. This can lead to a range of problems, including safety issues, even if it is just a result of your frustration making you more accident-prone. Do you like doing DIY? What safety precautions do you take? Lots of useful information, usually leave my husband to this side of things!!! My husband is a building contractor so luckily I don't have to worry about any accidents! Great info and safety tips for everyone ! Precaution is better than cure ! I am sending this post to my dad - he needs these tips! Thankfully my hubby has got better at DIY but he managed to fall off the ladder out of the loft once!